Sun Peaks paddleboarding is another 'SUPerb' fun-for-all summer Sun Peaks activity , which is available from when the ice melts on the Sun Peaks lakes in the spring, to when they freeze back over in the winter. New for fall - Night Time Stand Up Paddleboard Tours at Sun Peaks. What is Stand Up Paddle Boarding? • Great social activity or solitude activity if that’s your thing – just be safe! Where is Sun Peaks Paddleboarding? Sun Peaks paddleboarding lessons and rentals are operated by professionally certified instructor and International SUP competitor, Bodie Shandro, through his company Paddle Surfit. He is a terrific teacher and has taught people from 4 to 88 years of age at his beautiful, tranquil location on Heffley Lake just minutes away from Sun Peaks Resort (30-40 minutes from Kamloops). And nearby Heffley Lake is such a perfect spot for Sun Peaks Paddleboarding! Surrounded by scenic mountains and forests and with many undeveloped areas, this 7.2 km (4.5 mile) long lake is stocked with trout which you may see under your board, or see moose, deer, fox, muskrat, or perhaps bears along the shore, while loons cry hauntingly before ducking under the peaceful surface and eagles and ospreys fly overhead. There are also lots of hiking and biking trails nearby, but SUP on the calm waters is where it’s at! 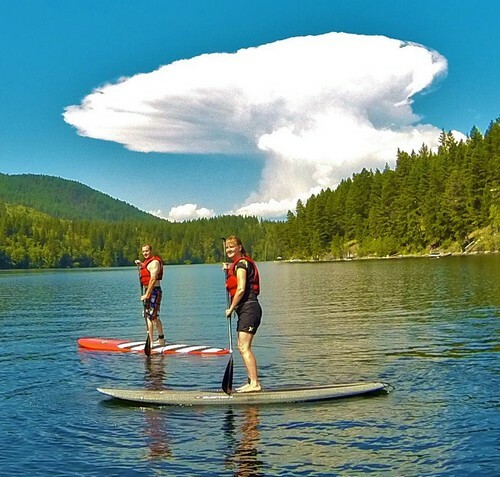 You can even rent your SUP and take it to explore other beautiful lakes near Sun Peaks, such as Johnson Lake or McGillivray Lake. 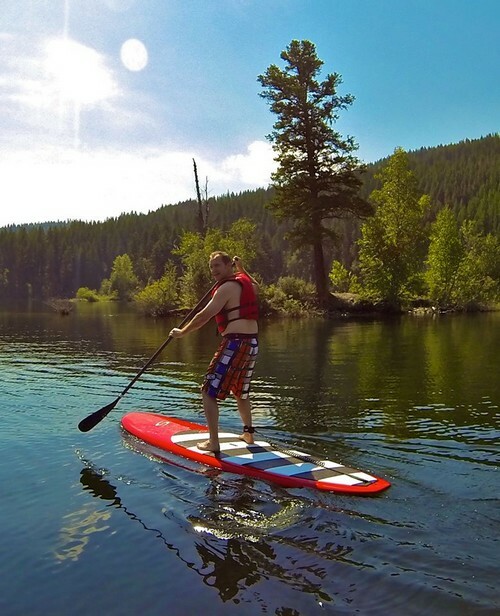 We were first-timers and loved it – read our Sun Peaks Paddle boarding review here. Interested in Standup Paddleboard Lessons, lunch and a guided hike/tour of the Top of the World at Sun Peaks? Check out the Lake to Peak Adventure Package. Guided standup paddleboarding tours to beautiful Johnson Lake are also now available during the summer for small, escorted groups. Put together a group of 5 friends or colleagues for a guided day of fun on spectacular Johnson Lake! $200 each includes return transportation from Kamloops or Sun Peaks, all your equipment and professional guide/instructor! Complete and submit the form below for more details. • Bring the basics for summer enjoyment – water, sunscreen, sun glasses, hat, etc. and be prepared to love being on top of the water! For more information about lessons, group SUP sessions, rentals or stand up paddleboard sales, complete the form below and Bodie will be in touch. Return to Best Sun Peaks home page.